Unpack all parts. Lay them out flat and organize them. Count out the screws. There should be 4 three inch screws (Long Screws) and 12 two and a half in screws (Short Screws) and one square drive screwdriver. 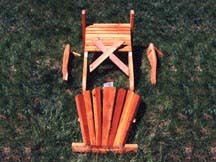 There should be a Bench Assembly, a Backrest Assembly and two Armrests with Gussets attached. 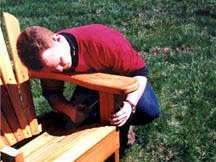 Rotate the X-Frame located at the rear of the Chair Base until it is straight up and down. Place the Backrest Assembly onto the Chair Base and position the X-Frame under the Upper Backrest Support. Secure bottom of Backrest to Chair Base with 4 medium(2.5") screws. Screw through the tips of the X-Frame up into the Upper Backrest Support with the short screws. In order to get the Backrest properly alligned it helps to put the screw into the X-frame piece so that the tip just pokes through the top. 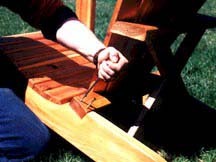 Then align the tip with the hole on the Backrest Upper Horizontal that it origionally came from. 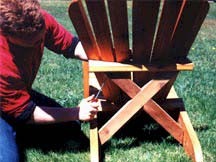 Tighten the screws that hold the X-Frame to the Chair Base if necessary. 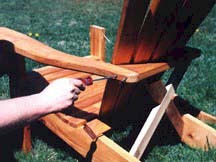 Hold one Arm of the Baldwin Chair in place and flush the back of the Arm to the back of the Upper Backrest Support. Screw through the Arm into the Upper Backrest Support with the short Screws. Putting the screw in so that it just peeks out helps to line up this part of the assembly also. Attached to the underside of each Arm is a Gusset. Flush the front of this Gusset to the front of the Front Leg. Screw through the Gusset into the Front Leg with a short screw. Screw up through the front and back of the Front Leg into the Arm with Long Screws. Repeat this step to attach the other Arm. Now the two outer backrest slats must be secured. Slide them out until they contact the armrests and screw in with 2.5" short screws. This completes the assembly. Relax and enjoy!